Over 480 dolphins have washed up along the Eastern Coast of America. For several weeks scientists were unsure what was causing these severely ill or already dead bottle nose dolphins to wash up on the beaches from New York to North Carolina. 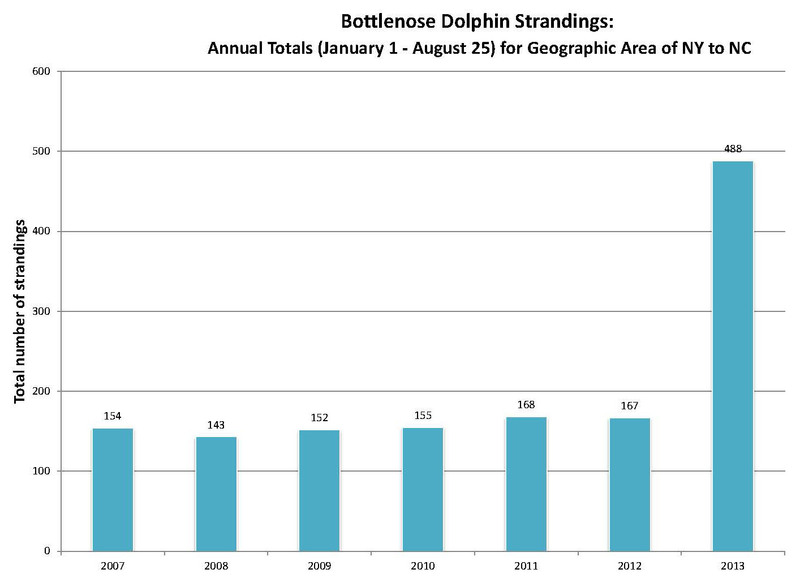 The highest number of dolphins to wash up on shore in a single state is 174. 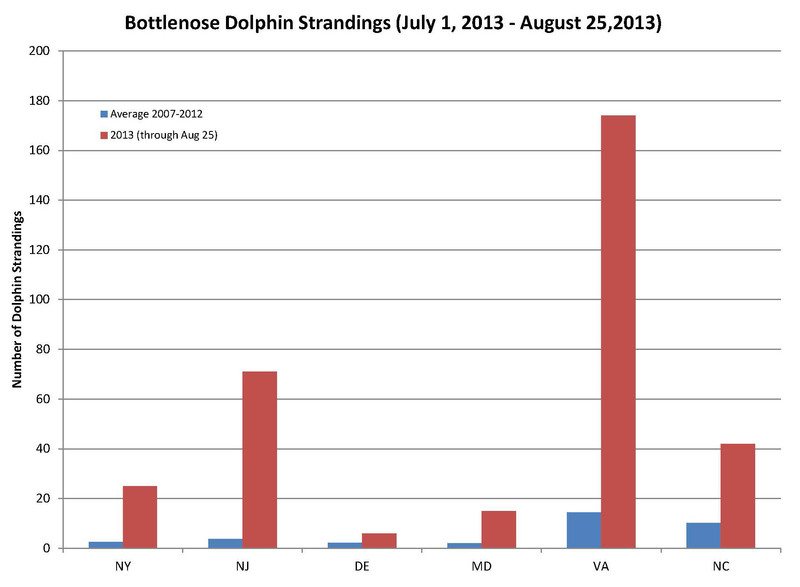 That’s right, 174 dolphins have washed up on the beaches of Virginia. 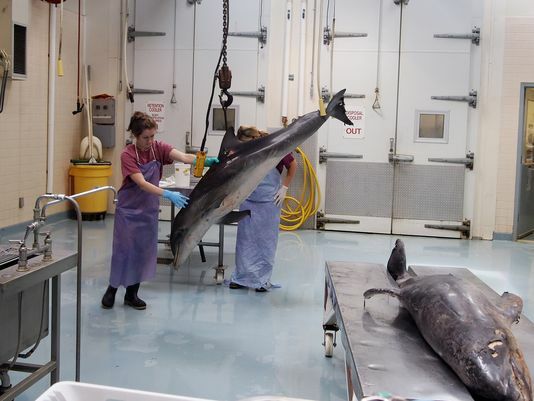 NOAA (National Oceanic and Atmospheric Administration) has been hard at work to identify the cause of the mass death of dolphins, which is said to be rivaling the 1987-1988 cetacean disease outbreak. During the 80’s outbreak 742 bottle nose dolphins died. Though the population decline due to the outbreaks does not rival the 1/3 of the worlds human population lost during the bubonic plague, it is still incredibly detrimental and will certainly harm the population growth in the future. The virus has been identified as the cetacean morbillivirus, a virus in the same family as the virus that causes measles in humans. NOAA is advising that if you spot a stranded dolphin not to touch it because it might have bacterial or fungal infections that could harm humans, even though the cetacean morbillivirus is of no threat to us. The dolphins that are dying from the virus seem to be under the age of 26 years old. This is because the immunity has been becoming less prominent. This can be due from anything from immune individuals from the 1987 outbreak dying off or leaving the pods that have become exposed to the virus. Those individuals that survived the outbreak in the 80’s will have immunity to the virus, which aids in the immunity of the entire pod. Dolphins have been making many rounds in the news lately due to the fact that it was recently discovered that they actually have names for each other. Now this doesn’t mean that dolphins are speaking english, but through a series of clicks and squeaks and the use of echolocation. It has also been proved this year that dolphins have the longest memory of any mammal, as they actually remember their friends ‘voices’ after 20 years.